If there was a major cosmetic problem with your teeth, most likely you wouldn’t hesitate to make an appointment to see the dentist. 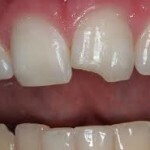 But when something minor happens, like a small chip or crack on one of your teeth, you might not be inclined to make a dental appointment right away if it was only a cosmetic issue. There’s no reason to wait, though. For cracked, chipped, and discolored teeth, or teeth that are slightly misaligned, there’s a simple and economical solution called dental bonding. It provides a result similar to what veneers offer, but at a fraction of the cost. The procedure is both quick and painless, and can either be used to improve a single tooth, a group of teeth, or even your entire smile. The process of dental bonding couldn’t be easier. A substance similar to putty is applied to the tooth or teeth in question, and then the putty is sculpted to an appropriate shape. Once the sculpting is done, a high-intensity light hardens the putty, and then finally the tooth can be polished until it has a completely natural appearance. Dental bonding is one of the least expensive cosmetic procedures in dentistry, and is generally suitable for all budgets. It’s also one of the most convenient procedures, and can usually be taken care of in a single office visit. It is also painless and can often be done without any anesthetic. Usually the process takes less than an hour, but of course the time involved depends on how many teeth are being treated. One of the concerns that patients often have is whether a single tooth with dental bonding will stand out from the other teeth, either by being a different texture or a slightly different color. The putty used for bonding can be color-matched to your other teeth, and should not stand out in any way. In addition, the polishing process allows the tooth to have the same sheen and reflective qualities as the rest of your smile. In most cases, no one should notice that your bonded tooth looks any different from your other teeth. Bonding can be used for a number of cosmetic purposes. If you want to make your teeth look longer, close a gap, repair a misshapen tooth, or any other cosmetic dentistry, give us a call to make an appointment for a consultation.